While single note essential oils are potent plant medicine, there’s nothing more magical, or effective, than combining single notes to create a blend. 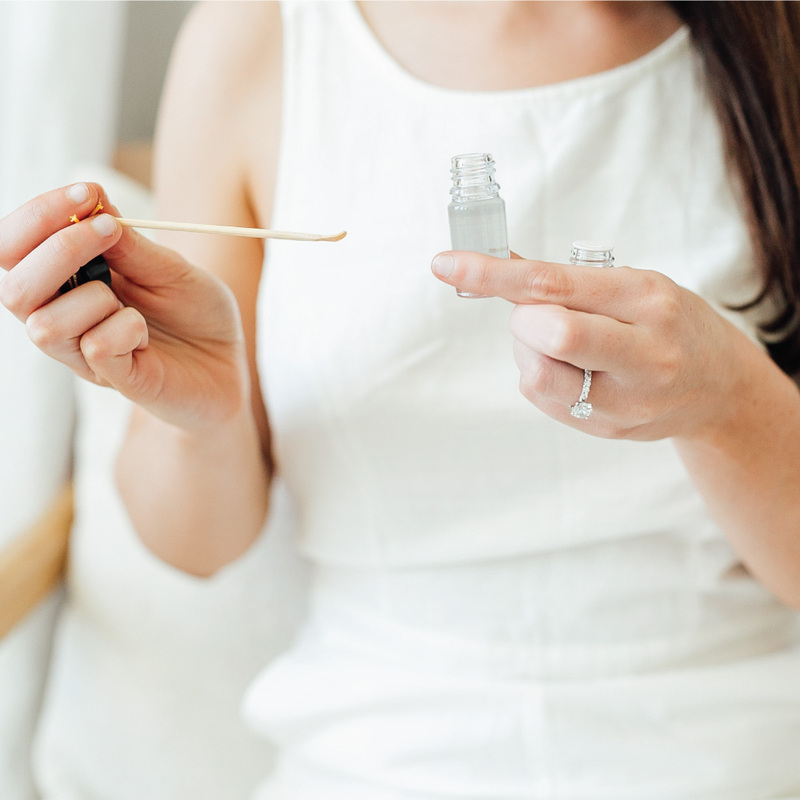 When it comes to blending essential oils, there are many different schools of thoughts, but the goal remains the same: to marry the art and function of an oil with others. Blending multiple essential oils together maximizes therapeutic benefit while enhancing the overall aromatic experience. Blending combines single notes with different healing abilities and characteristics to create a targeted, customized remedy. All methods of blending, whether based on intuition or chemistry, can deepen and expand our understanding of any given essential oil and in turn support more comprehensive treatment. In my eyes, synergistic blending is truly the heart of essential oil therapy. What Is A Synergistic Blend? When it comes to blending, you can mix whatever essential oils you’d like. But, there is a method in which the sole goal is to combine essential oils for maximum therapeutic benefit. This harmonious approach is defined as synergistic blending. A synergy is defined as a cooperative interaction of two or more essential oils that when combined, produce an effect greater than the sum of their individual effects. When essential oils combine, new chemical bonds are created, which in turn strengthen a synergy’s healing powers. Because blending essential oils creates entirely new compounds, a successful synergy is one in which the molecules of the selected essential oils work well together. In fact, the word synergy literally means working together (syn meaning together and ergon meaning work). Therefore, it’s no surprise that essential oils from the same botanical family or composed of similar chemical constituents are often found together in aromatherapy blends that target specific pain points. Blending essential oils is particularly beneficial when diffusing or applying essential oils topically because an aromatic synergy works on multiple levels of the body – physiologically, emotionally, and energetically – to achieve multiple goals. In any essential oil synergy, there are typically three or more oils. At Saje, the essential oil blends are carefully curated with the most pure ingredients for the ultimate healing effect. There are many frameworks that guide the building of a synergistic essential oil blend, but a great place to expand your understanding of how essential oils work is by thinking about the botanical family from which the essential oils are derived. A botanical family is defined as a group of plants that have a characteristic in common. For example, the mint family is called lamiaceae and is well known for its aromatic members (or species), like peppermint and rosemary. Most plants in the mint family look similar, and are characterized by square stems, paired leaves, and tubular flowers. But, the mint family has many members including the lavandula genus that houses the many different lavender species. Since essential oils are distilled or expressed directly from the material of a specific plant species, they contain chemical components that are also often present in other essential oils derived from other members of that particular plant family. In this regard, essential oils from the same botanical families are like siblings – they’re not identical, but they often share properties that support similar therapeutic actions. The first step in choosing a blend is determine your therapeutic goal. For instance, perhaps you’re in need of a calming influence, or maybe you want some natural relief for your aching body. Once you choose your goal, you can start looking for essential oils blends that can support you in the best way possible. The Stress Release blend features a synergy containing lavender and clary sage, which are both members of the mint (remember lamiaceae!) family. While they belong to different genuses, both lavender and clary sage are chemically composed of esters. Esters are molecules that have a knack for calming the sympathetic nervous system, which make both lavender and clary sage popular choices for synergies aimed at relaxing and dissolving stress. The affinities among family members are also demonstrated in Pain Release. Pain Release works to relieve muscles and ease soreness by tapping into the powers of two major plant families: mint (lamiaceae) and myrtle (myrtaceae). Lavender, peppermint, rosemary, and sweet marjoram are all included in the Pain Release synergy and they all belong to the mint family. Despite being from different genuses, they complement each other’s unparalleled soothing and calming actions. Eucalyptus and cajeput essential oils, also in Pain Release, belong to the myrtle family, which has an affinity for easing the body. When combined, the cooling myrtles and healing mints provide instant relief anywhere on the body. Trying Pain Release just once will show you that a synergy has more healing powers than any one essential oil could provide by itself. There is no such thing as a right or wrong way to choose a blend, but it’s important to be aware of safety, particularly dosage and adequate dilution. Nut, seed, and vegetable carrier oils are used for safe topical application and the dosing depends on the method of application (body area being treated), age of patient, safety profile of essential oils used, integrity of the skin, whether it’s an acute or chronic condition, and more. And, always be sure to look for blends created with 100% natural ingredients. All Saje topical essential oil blends have been created with your wellness -- and your safety -- in mind, which means you don’t have to worry about dilution or dose. Those factors have already been taken care of for you. 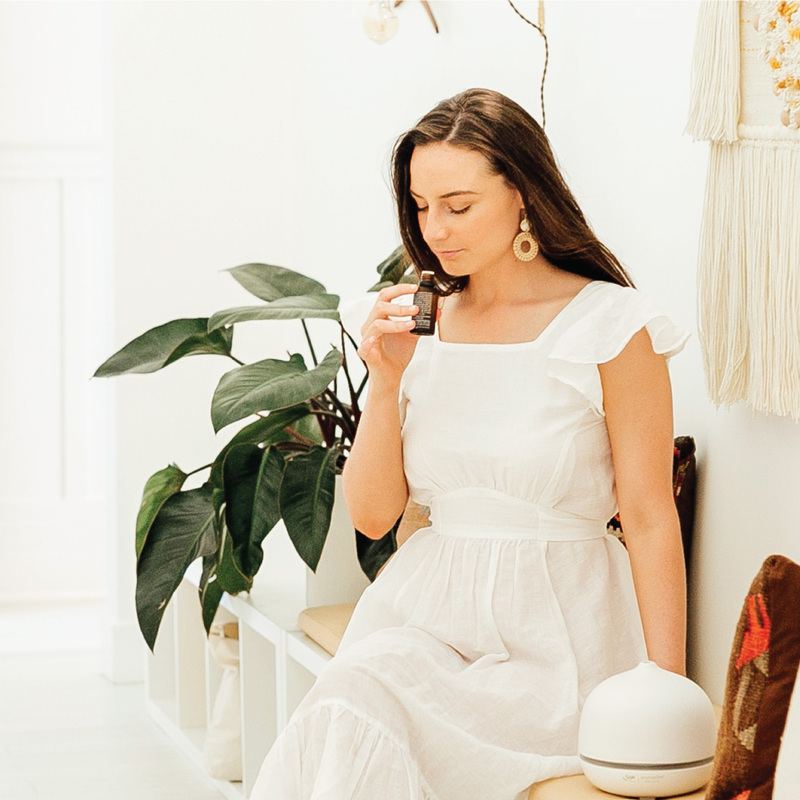 A great place to start your experimentation with blends is the Pocket Farmacy, which contains five supportive blends, including the Stress Release and Pain Release blends. 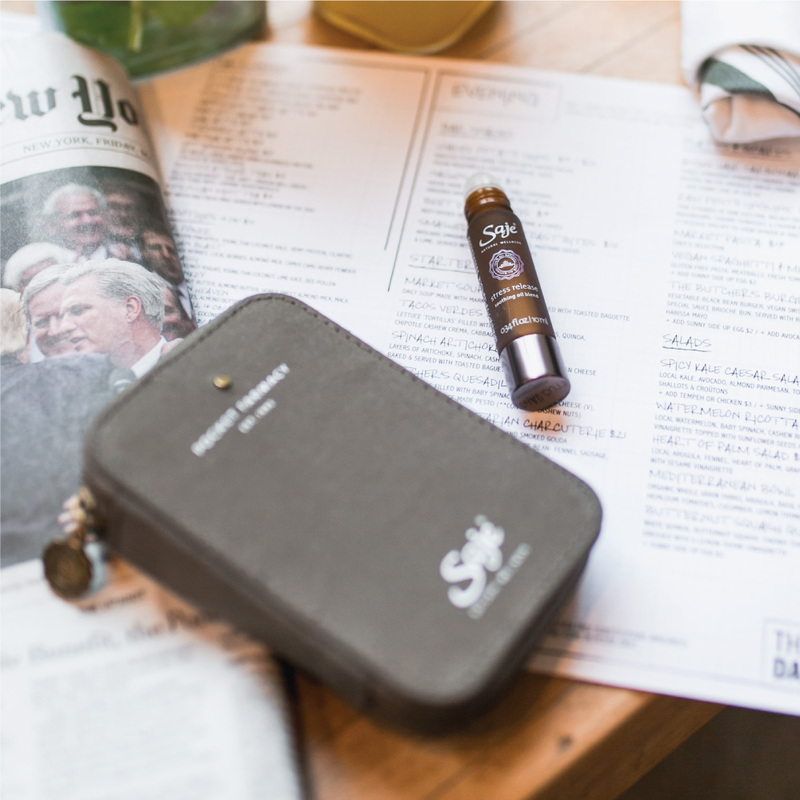 Perfect for travel and using on-the-go, keep the Pocket Farmacy with you and roll on the blend that suits your wellness the best. Start your essential oil journey by choosing the Pocket Farmacy, and see which blends you gravitate towards. Leigh Winters is a neuroscientist and natural beauty expert. She currently works in biotechnology developing science-based treatments for chronic skin conditions. Previously, Leigh served as a fellow at Columbia University’s Spirituality Mind Body Institute, where she researched contemplative practices and bio-behavioral health.